K-Flex Duct™ Liner Is Designed For The Sheet Metal And Insulation Contractor Market. Used for school, hospital, hotel and clean room environments. 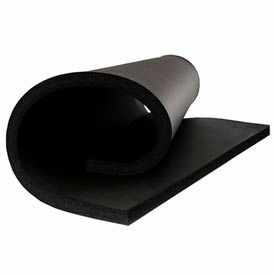 Environmentally-friendly, CFC- & HCFC-free, closed cell flexible elastomeric thermal and acoustical insulation. Non-porous, non-fibrous and resists mold growth. Used for reducing heat gain and preventing condensation or frost formation on hot equipment or ducts. EPA registered antimicrobial agent provides additional protection against mold, fungal and bacterial growth. Recommended for applications ranging from -40 to 200°F. Skin 2 Sides (S2S) Insulation includes a skinned surface on both sides for superior tear and weather resistance. Pressure Sensitive Adhesive Backed Insulation has a skinned surface on one side and tear and moisture resistant polyolefin easy release liner with continuous reinforcing scrim on the opposite side. Scrim prevents stretching of insulation and improves peel strength. Used for new and retrofit applications. GreenGuard® certified. FM approved. UL 94 recognized. ASTM tested. Click here to view Data. K-Flex Insul-Sheet® Sheet Insulation Delays Heat Gain And Prevents Condensation Or Frost Formation On Cold Equipment, Tanks, Vessels, Ducts And More. Environmentally-friendly, CFC-free flexible elastomeric thermal insulation. Non-porous, non-fibrous and resists mold growth. EPA registered antimicrobial agent provides additional protection against mold, fungal and bacterial growth. Recommended for applications from -70 to 200°F. Closed cell structure delays flow of moisture vapor and is considered a low transmittance vapor retarder. Skin 2 Sides (S2S) Insulation includes a skinned surface on both sides for superior tear and weather resistance. Pressure Sensitive Adhesive Backed Insulation has a skinned surface on one side and formulated scrim reinforced acrylic adhesive with tear resistant liner on the opposite side. GreenGuard® certified. FM approved. UL 94 recognized. ASTM tested.